There are 5 reviews of Cool Water Wave Woman. 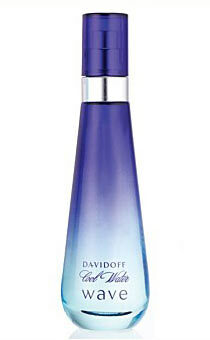 Fruity, floral fun in a blue bottle. Finally! A fruit perfume not overloaded with peach. Great fruit combo here. I get some peony and freesia after the fruit settles down. Unfortunately not much else after that. After an hour I detect a subtle musk. Not much for longevity. As it is inexpensive, one can over-spray again and again. A good poolside fragrance. fresh fruit top notes of watermelon, mango, passion fruit and guava over floral mid notes of peony, freesia, and heliotrope. The scent finishes on base note of pink peppercorn, iris wood, sandalwood, amber and musk. Me likes! Woody/fruity/floral. Really does smell very unisex although I have not worn it for very long as yet. I get mango/melon over wood. Very nice fragrance. On me when I first spray this, I smell a woodsy tobacco scent that lasts for about 15 minutes and has almost an earthy smell to it. With the initial sprays, I would say this fragrance could be unisex but then it settles into your skin becoming more feminine with nice floral notes. It is a clean, fresh, aquatic smell which is light and not overpowering. It does not smell fruity although I smell some watermellon in it (the florals stand out more). The notes I smell are freesia, peony, sandalwood, watermellon, and musk. There may even be a hint of amber in it? I think it is best suited for the day because it is not a sensual fragrance. The only down fall is the staying power doesn't last long, and it sits very close to the skin, but overall it's a nice scent. Very nice. The feminine companion to Ralph Lauren's Polo Blue, one of my faves. To my nose, what sticks out is a melon that's not overly sweet. Much better than the original IMO as the original posseses a bug spray quality that can come off wrong at times. aquatic as the origina one but less frutiy and more floral, big note of jasmin and lily of the walley. There are no member images of Cool Water Wave Woman yet. Why not be the first?